For Maintaining This Battery: The Odyssey OBC-6A charger can be used. For Ongoing Deep Cycle Recovery: The Odyssey OBC-12A charger is recommended. Odyssey trademark is the property of Enersys and affiliates. With 3-10 years of service life, ODYSSEY batteries save consumers time, money, and aggravation. 70% longer cycle life compared to conventional deep cycle batteries - up to 400 cycles at 80% depth of discharge - high stable voltage for longer periods of time. The highest recharge efficiency of any sealed lead battery on the market - capable of 100% recharge in 4 - 6 hours. This 12v dry cell battery has the characteristics of two separate batteries are combined in one box. It can deep cycle (be recharged) as well as provide enormous cranking power. The 5 second cranking power of Odyssey batteries is double to triple that of equally sized conventional batteries, even when the temperature is as low as -40°C (-40°F). Non-spillable design - can be mounted on any side in any position except inverted. Design protects against high impact shock and mechanical vibration - a common cause of premature battery failure. Operating temperatures from -40°C (-40°F) to 45°C (113°F), for models without a metal jacket and from -40°C (-40°F) to 80°C (176°F) for models with a metal jacket. No need to add water, ever! 12v dry cell battery design with resealable venting system. US Department of Transportation classified as a 'non-spillable' battery. No acid spills, no escaping gases. Order today and receive free standard shipping on your Odyssey PC925LMJ Battery with Metal Jacket. Only valid in the contiguous 48 states and not valid with any other offer. Physical address required (No PO Boxes). New! Odyssey PC925 with positive terminal reversed. Direct fit HARLEY DAVIDSON 1997 and later FLHR, FLHT & FLTR battery. Here is a OEM comparison image. 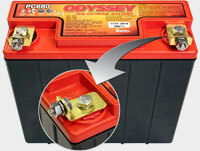 The Odyssey PC925LMJ battery with metal jacket combines in one box the characteristics of two separate batteries. It can deep cycle (be recharged) as well as provide enormous cranking power. Only Hawker Odyssey batteries are based on the same battery technology offered by Hawker to the military for aircraft and tank batteries. 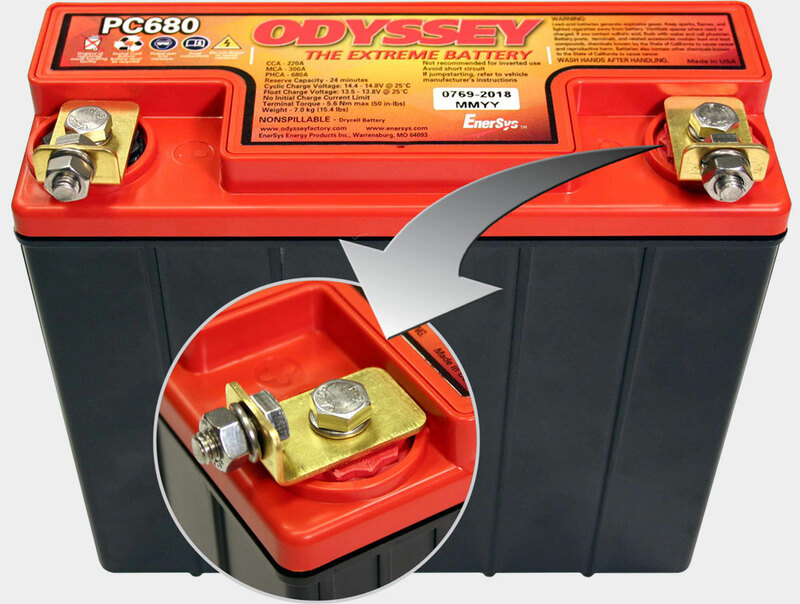 Odyssey batteries are of military grade and have endured rigorous tests that demonstrate their overall ruggedness and exceptional tolerance of mechanical abuse. The 5 second cranking power of Odyssey batteries is double to triple that of equally sized conventional batteries, even when the temperature is as low as - 40° C. Also, with simple constant voltage charging (alternator or independent charger), there is no limitation on the inrush current, so the user is assured of a fast charge. With Metal Jacket: Provides a slightly higher operating temperature range, slightly more vibration resistance, and protection again debris that may hit the battery (when used in compatible applications). 3 to 10 year service life, when properly maintained. The lack of acid eliminates the fear of acid burns or damage to your expensive chrome and paint. You're installing an Odyssey battery because you love your vehicle. You shouldn't have to be concerned with things like leakage. This is the third Odyssey PC925LMJ that I have ordered from Battery Mart and am bery pleased with the Battery as well as the stellar Customer Service. I ordered this one for a Riding Buddy and he is extremely pleased also. Thanks Battery Mart for great prices and service. Highest quality products at the best prices with super fast shipping. This is the 4th Odessey we have purchased. This one replaced one that lasted 9 years! We are repeat customers and will be back. I bought the Odyssey PC925LMJ to replace the exact same one in my Harley. It lasted 7 years and now was was getting weak. It costs twice as much as a regular battery but lasts twice as long, so for me it's the best choice. I installed this battery in my whole house generator. I live in a hurricane area and I need a RELIABLE starting battery with long reliability that is on the ready when needed. These Odyssey Batteries have a reputation for LONG LIFE, due to the solid lead plates. The generator is an entity that can easily forgotten because of limited use. I feel like the added durability/reliability justifies the cost. I have purchased from Battery Mart in the past because they offer batteries for ALL applications with a price range to suit the buyer. They are PROS when it come to shipping! The battery is quite heavy and can be set in several ways! On any side except the top! It fit my Orion Reeper perfectly as far as size. The terminals weren't the same as my old one but not hard to remedy that! It has a lots of power as the machine has never started as easily as now with the new battery (and I bought the Reeper new) The battery came quickly and well packed! I recommend Battery Mart as a good battery source!!! 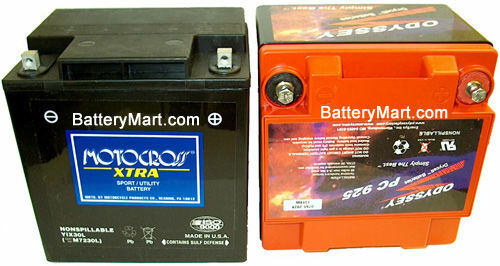 Battery Mart always delivers best batteries at the best price.. Battery Mart's purchasing department constantly works with suppliers to offer our customers the web's best prices. But we cannot guarantee our negotiated rock bottom prices on Odyssey PC925LMJ Battery with Metal Jacket will remain this low after April 25, 2019. Buy today for $200.99 and save ($200.99) (-inf%).